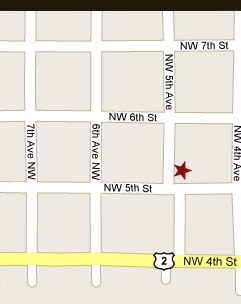 The Swanson Law Office is located on Fifth Street and Fifth Avenue Northwest (across the street to the East of Photo Express and to the North of Ogles Marketplace Foods and Chad Sterle Law Office). Follow the ramp (North side of the building) to the entrance on the rear (East) side of the building. NOTE: The use of the Internet for communications with this firm will not establish an attorney-client relationship and messages containing confidential or time-sensitive information should not be sent. Because we highly value your trust, we will not share your email and other personal information. ©2010 Swanson Law Office, P.C.